Lyme Disease is a real threat to those who go fishing, unlike the recent hysteria over the rarely transmitted dog tapeworm larva (Echinococcus granulosus) to humans. In 2011 there were over 30,000 reported cases in the U.S. of often debilitating Lyme disease. It is usually transmitted by the small, hard-to-see deer tick, which has as its primary host white-tailed deer. Density of deer and density of ticks is closely related. A new map has just been produced showing the actual density of deer ticks. Here in the Northern Tier of PA and Southern Tier of NY we have some real hot spots. The infected area is spreading. It also doesn’t help that we are having a mild winter. This means the cold weather (or lack of) is NOT killing enough of the ticks. 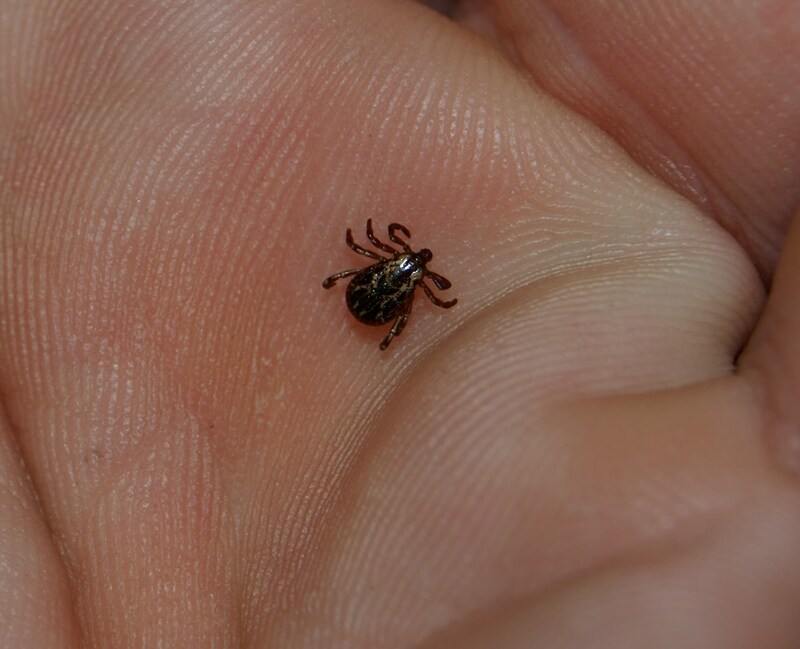 Last year was a bad year for ticks… unfortunately, I’m thinking this year will be even worse. As you can see in my circle. Bradford/Sullivan Counties are considered a hotspot! As well as all of PA from Wayne County to Chester County. Areas in the United States where people have the highest risk of contracting Lyme disease are pinpointed in a new map created by the U.S. Centers for Disease Control and Prevention. Lyme disease is one of the most rapidly emerging infectious diseases in North America. It’s transferred by ticks and symptoms range from headaches, fever and a rash to arthritis and Bell’s palsy, or damage to a facial nerve that can lead to temporary paralysis of the muscles on one side of the face. At least three closely related bacteria cause the disease. It is transmitted by the bite of deer tick and is usually easy to treat with antibiotics if discovered early, but as time goes by treatment gets harder as the organism settles in and begins to damage various organs. Even us DFP’ers get ticks. I had one embed itself in my arm while fishing on the Oswayo Creek near Shinglehouse, PA. I was sitting on a nice manicured lawn along the creek when I got the tick. It wasn’t in a classic tall grassy area. So be on the lookout! The incidence of the disease is reduced by careful examination of clothing and skin after (and while) outdoors, knowledge of the first symptoms, and reduction in deer ticks. Outdoor activities such as flyfishing, hiking and of course, hunting will put more folks into areas that could lead to a tick bite. The best way to combat getting a tick bite to to wear waders or long pants and to wear shirts with long sleeves. Staying out of tall grassy areas with exposed skin helps. But what’s a dirtbagger to do when we are fishing along weedy growth areas? Wear some ”bug juice” that has Permethrin in it. Permethrin forms a bond with fabric and will last through several to many laundry cycles. It is a toxin but in this case it is bound to the fabric, and therefore cannot harm you. This is what all of our Armed Forces use on their uniforms. The warnings should not be dismissed but are there mainly to avoid lawsuits, e.g., kind of like warning labels on hammers.